A CN locomotive passes by freight containers at the CN Taschereau yard in Montreal. The head of Canada’s largest railway dismissed concerns about a looming trade war between China and the United States, stressing flexibility as he pointed to producers that have moved operations out of China to other Pacific countries. “Overall, we’re very bullish about trade from Asia, especially trade from Asia to North America in 2019, but it might be coming from different countries or different ports of origin,” Ruest said, pointing to new factory locations. “A number of them already moved out of China. They’re going to Vietnam, they’re going to Bangladesh, they’re going to Indonesia, and the product is still being made,” he said. 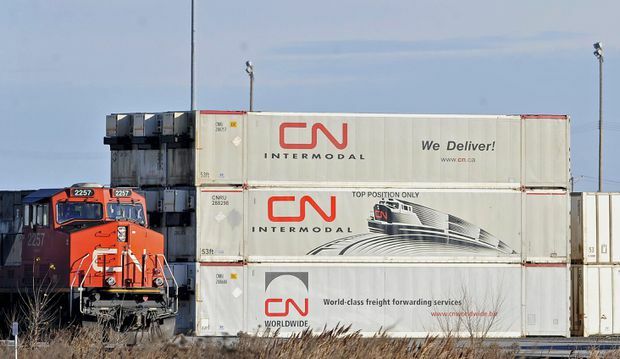 On Tuesday, CN Rail reported the highest quarterly revenues of its 99-year year history, helping the Montreal-based company address concerns over operating capacity. “In October, CN said it didn’t have enough crews to handle increased demand prompted by a stronger North American economy,” Poirier said in a note to investors. Ruest pointed to higher and more “nimble” capacity in the months ahead. “We had an acceptable July, a solid August and a challenging September, as we were completing many construction projects under heavy demand on a very busy Western mainline corridor,” Ruest said. The railway reported after markets closed that it earned a net income of $1.13 billion in the quarter ended Sept. 30, an 18 per cent year-over-year increase. Third-quarter revenues grew more than 14 per cent to $3.69 billion – a CN record for any quarter – from $3.22 billion. Revenues grew 25 per cent for petroleum and chemicals, 15 per cent for grain and fertilizers, eight per cent for intermodal, 15 per cent for forest products, 15 per cent for metals and minerals, 25 per cent for coal and three per cent for automotive. Higher fuel surcharges, freight rates and a weaker Canadian dollar also factored in, according to CN. CN says it is still expecting between $5.30 and $5.45 per adjusted diluted share this year, versus an earlier 2018 guidance of $5.10 to $5.25. The company is also reporting an operating ratio, which measures its efficiency, of 59.5 per cent, 2.3 points above the same quarter in 2017. Operating expenses for the third quarter shot up by 19 per cent, mainly driven by higher fuel prices, higher labour costs and a weaker Canadian dollar, among other factors, CN said.